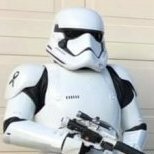 Looking at a bucket build of a TLJ trooper. Any recommended sources would be helpful. Love the look, but I want to Get a bucket just for now. Still waiting on my ATA armor and wanting something else to build, till then if it's reasonably priced. Any recommendations Please. Most of the ones out there that I know of come from KB Props. There is also Jimmiroquai, Both also sell complete kits, so there is that. Eventually Anovos will deliver their offering as well ... I hope. I'd go with Jimmiroquai right now. KB is dealing with backorders still and Anovos, who knows when. There's also 850 armorworks, but I don't know much about working with them. Haven't heard bad things. I just recommend Jimmi as he's quick, reliable, and detailed armor. His V5 kit he just produced is very good. JUST the bucket, not the whole armor? Depends on whether you want [flexible] fiberglass or ABS. Jimmiroquai's armor is fantastic, but it's quite a bit of work, dealing with fiberglass. He's a reliable source, with a great rep, so if you're cool with fiberglass, it's an excellent option. Anovos will mostly likely deliver... eventually. But could literally be years. Finished helmets only, for some time, so if you're looking a build, that's not what you want anyway. KB might be up and running someday, but not in the short term. Hopefully that turns around, but not going to help you now. I've not worked with 850 before, but I've heard very good things from people who have. If you want ABS, and you want it sooner than Anovos or KB can deliver, it's probably your only choice. Just talked to 850. They don't have TLJ helmet or armor. I will look at the other recommendations. Jimmi definitely does have a great kit. It is fiberglass, but I will be honest with you, I've never worked with any kit before. My Jim kit for TLJ was my first kit ever and it hasn't been too bad of a build it's had some things. Really as long as you have good sources and guides you can build it just fine. You can check out my build thread for an idea of what you'll be working with. Where do I find your build thread? This thread is a bit old but if you are still looking this is a really sharp TLJ helmet. There is also TDK Props, in Australia. Tom has a very accurate helmet, he may still have them available. AI'd go with Jimmiroquai right now. KB is dealing with backorders still and Anovos, who knows when. Following up on my post here. As of now I would say avoid 850 like the plague. I had a garrison member purchase from them and first they were not given all the parts. As such a local member is having to help try to build the parts for them. Second the pulls are very thin and cheap in quality, as such there's worry it may not last or may not be approvable. Be warned with this vendor. AFAIK at this time Jim is your most reliable and best bet.